Mozart’s opera Don Giovanni had its premier here on 29 October 1787 and Mozart himself sat at the piano conducting the orchestra. 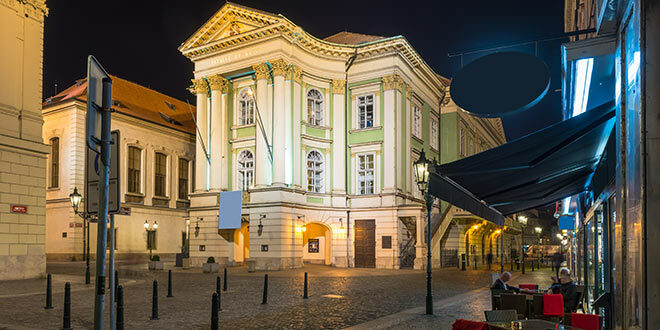 Built in the 1780s by Count Nostitz Estates Theatre is Prague’s oldest theatre. The Czech anthem (called Where is my home) was first performed here as a part of the comic opera Fidlovačka. This venue usually presents Mozart’s operas but other composers’ works can also be experienced here. The theatre is one of the most beautiful historical theatres in Europe. Part of its charm, magic and value lies in its historical significance, from the musical career of Mozart to modern times. For the filming of Amadeus director Miloš Forman requested use of the theatre as a set. But since he did not enjoy good standing with the government, having defected in the 1960s, he was denied any access to the place. Finally, it was agreed that he could film in the theatre, if a portion of the film’s profits were to go towards restoration of the building. This is why it was one of the most splendid sights in Prague, even during the communist era. In 1786, Mozart’s The Marriage of Figaro was performed here, and in 1787 Mozart conducted the premier of Don Giovanni. Also La Clemenza di Tito had its premiere in Estates Theatre.